Is Sarah Palin going to become a nightly talk show host like Megyn Kelly or Sean Hannity? She filled in last week on One America News Network, or OANN, a small cable channel that wants to rival Fox News someday. OANN very much wants to have Palin stick around, but at the moment there are no further plans for her to host. "We'd love to have Governor Palin as a full time host, but we'd need to convince her to relocate for long periods of time and I don't think we are at the point as a network where we can afford what she is worth," Charles Herring, president of the San Diego-based channel, told CNNMoney. Herring said the response to Palin's guest hosting was "tremendous." He also said "we'd love to have Governor Palin back as a guest host as often as we can." Palin certainly brought a jolt of publicity to OANN, which launched two years ago. It portrays itself as an alternative to Fox News, the dominant cable news channel among conservatives. But the channel is relatively obscure and isn't rated by Nielsen. It has struggled to gain carriage on cable lineups, just like many other upstart news and entertainment channels. Right now it is available in "just over 12 million" homes through Verizon FiOS, AT&T U-Verse TV and some smaller distributors, Herring said. Fox News is available in 95 million homes. OANN signed up Palin for a one-week stint at the 10 p.m. program "On Point" after its host for the past year, Tomi Lahren, abruptly departed the channel earlier this month. Herring said OANN has some other "amazing guest hosts in the works and hope to make an announcement in the near future." As for Palin, she made news by accusing ESPN of "swallowing ISIS propaganda" and by booking interviews with three Republican presidential candidates, Donald Trump, Jeb Bush and Ted Cruz. The Trump interview was panned by critics as a "lovefest" between the two, and "incoherent," but it generated an enormous amount of attention for OANN. The "exclusive interview trifecta," as Herring put it, actually crashed the channel's web site on Friday night as people sought it out. OANN posted the Trump interview on YouTube, and it's had 2.7 million views there so far. "We recognized that Governor Palin is a big name, but we underestimated the interest and demand for Friday's 'On Point' program," Herring said. Palin, a former governor of Alaska, started out as a broadcaster. She majored in communications in college and covered local sports for an Anchorage TV station after graduating. OANN's ad for her guest-hosting week described her as a "journalist" as well as a "vice presidential candidate." 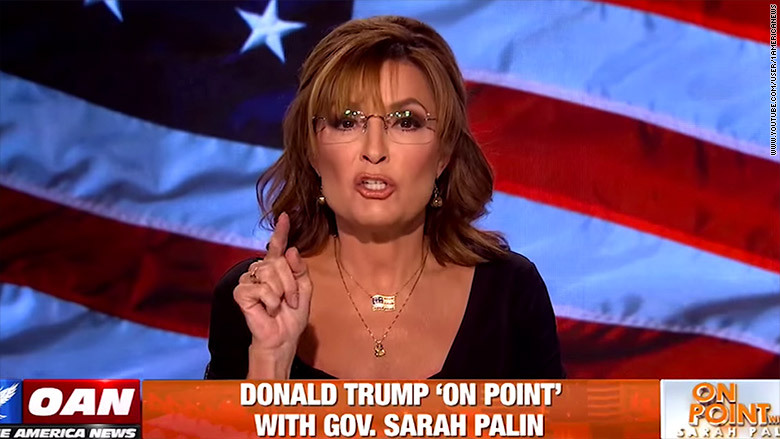 Palin's guest-hosting for a Fox News wannabe was intriguing given her history with Fox. After her unsuccessful run in 2008, Fox News chairman Roger Ailes signed her up as a paid contributor. The channel also said that Palin would host an occasional series, but only one episode ever wound up airing. Ailes was said to have concluded that Palin was a better guest than host. Palin and Fox went their separate ways in early 2013, then paired back up six months later, then split again in June of this year, freeing her up to work for rivals.